Thanks, mom, for always digging up the best pictures to post on Facebook. This gem from about 1995 was shared today. I’m at far right, breaking every fashion rule imaginable in those socks & sandles. And didn’t I look thrilled to be waiting for the parade? Happy 4th of July weekend, and I hope you’re all as festive as my family was. Someone named Damon in Ohio is giving me a run for my mileage. 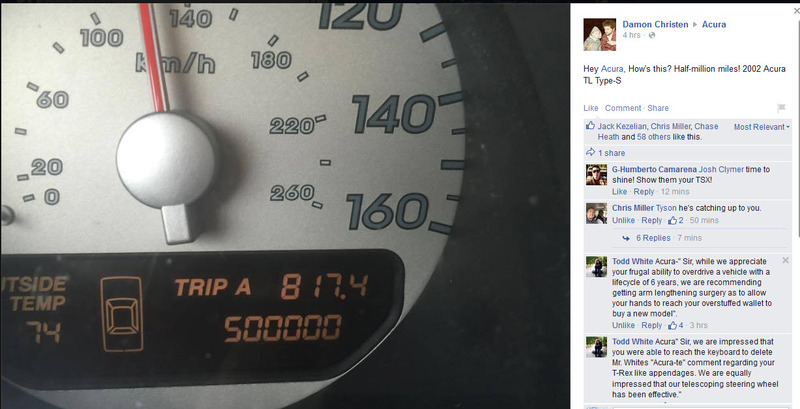 He posted on Wednesday to Acura’s Facebook page after hitting 500,000 miles in his 2002 Acura TL. That comes out to a little over 38,000 miles per year. Impressive. Apparently he drives 200 miles round-trip to his job. Keep the miles coming, Damon. Urban exploration (often shortened as urbex or UE) is the exploration of man-made structures, usually abandoned ruins or not usually seen components of the man-made environment. Photography and historical interest/documentation are heavily featured in the hobby and, although it may sometimes involve trespassing onto private property, this is not always the case. It was a little over a year ago (May 2014) when I let my curiosity get the best of me and finally went wandering around inside an abandoned automotive racetrack called Beeline Dragway that had been unused since about the late 1970’s. 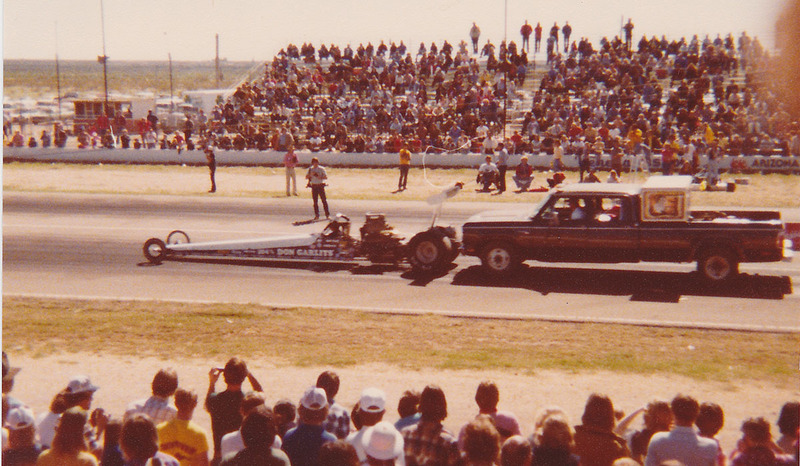 The dragstrip’s run in operation was short lived, at only a little over a decade. Since I drive past that same location every weekday on my commute home via Highway 87, it dawned on me the other day that I couldn’t see the tower any longer. “That’s odd,” I thought. Why would they decide to finally tear a building down that had already been abandoned for 4 decades? Was there some trouble going on in there perhaps? 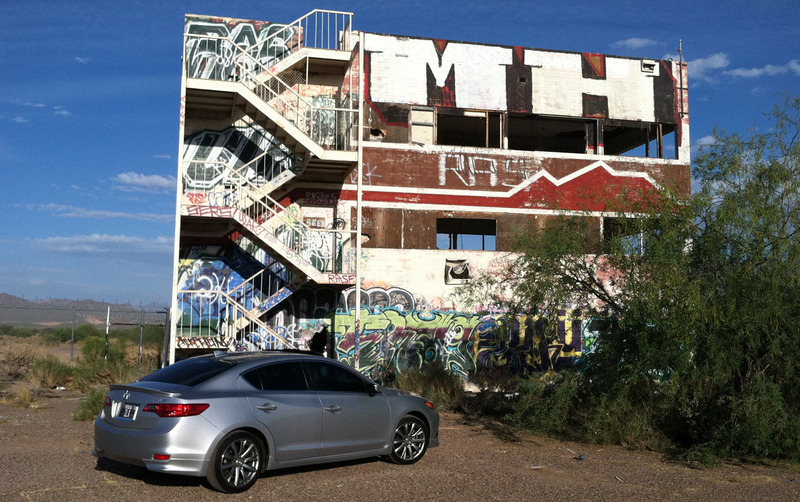 So, I pulled off the highway and started cruising around in search of any remains for the building. 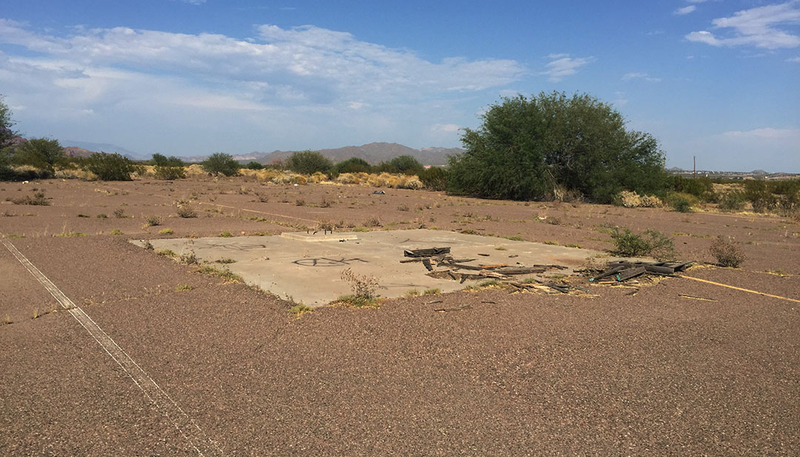 I found this particular concrete slab, but the location just didn’t feel right. I clearly remembered being further east than this. 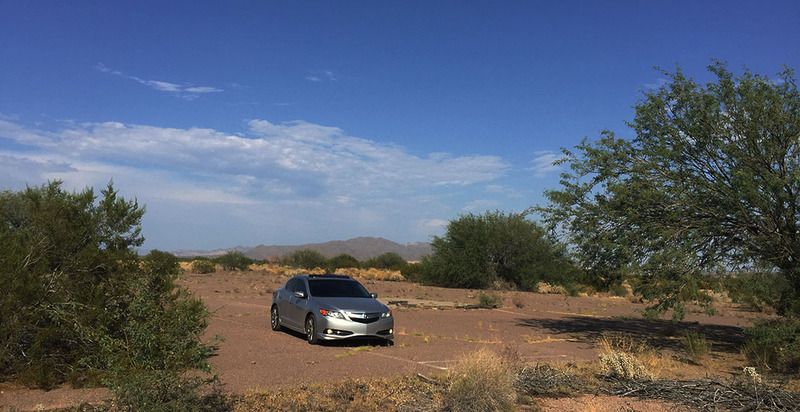 So I went driving around on the dirt paths out there. And, then I had an idea. Google Maps. 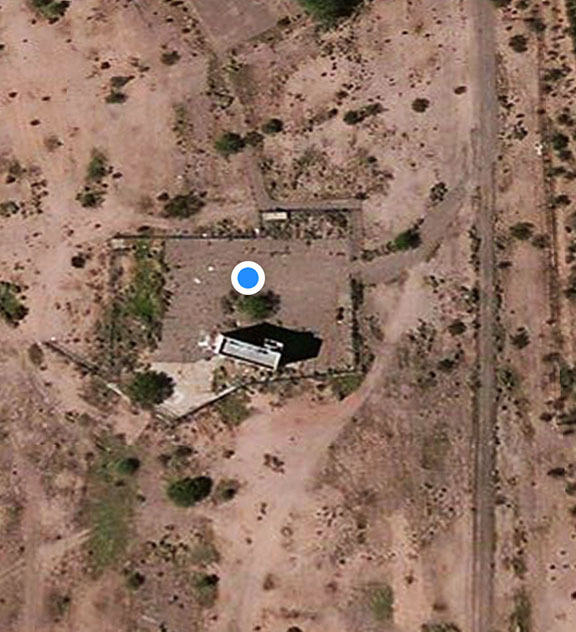 If I pulled up the satellite view, it would probably have an older image that would still show where the concrete tower & staircase used to stand. BINGO. I zoomed in and saw the rectangular shape, and I drove my ILX over to park directly in front of where that building used to stand. I was the blue dot here. These are the photos I took in that spot, where the building would have been in the background. 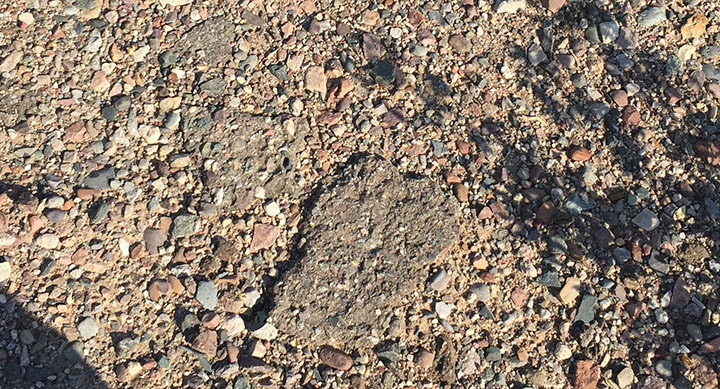 Nothing now remains aside from a few chunks of blacktop. Another Phoenix landmark gone by the wayside, much like Bill Johnson’s Big Apple and Pinnacle Peak Patio. Special guest for the occasion was Billy Carter, brother of then-president Jimmy Carter. Here he is riding atop a 1978 Corvette. Hope everyone has a safe & fun holiday weekend. 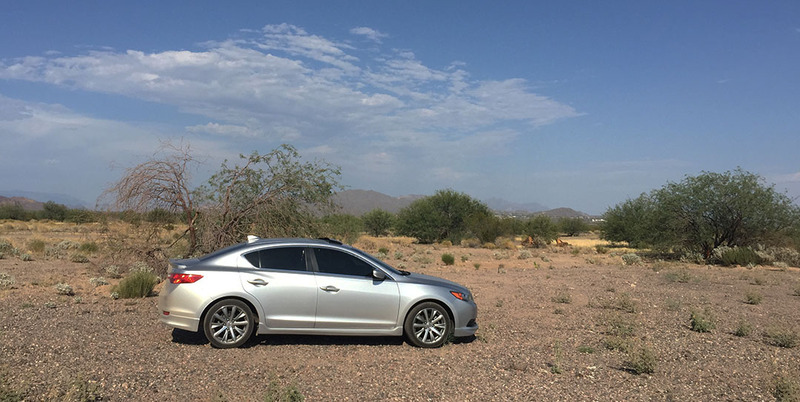 This entry was posted on July 2, 2015 at 4:55 pm and is filed under Arizona, ILX. You can follow any responses to this entry through the RSS 2.0 feed. You can leave a response, or trackback from your own site. 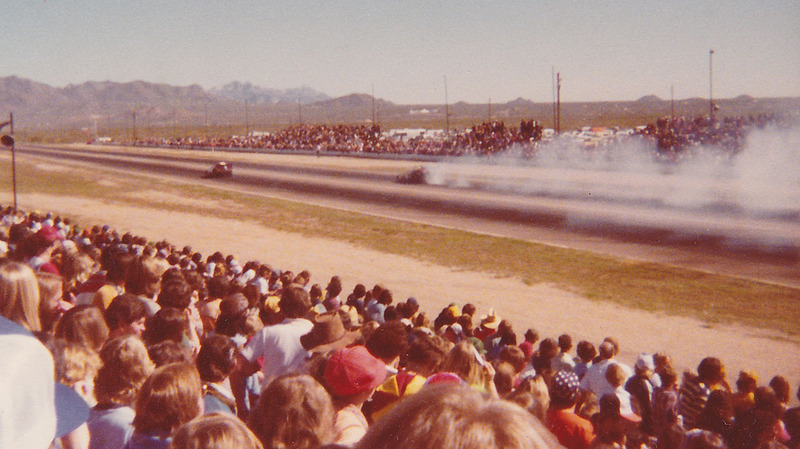 One of the first “events” I was taken to when visiting Phoenix in ’78 was Beeline Dragway by a friend who recently relocated here from N.Y.
LOL, guess the chamber of commerce must have thought it was a good idea. This is awesome! Thank you for sharing that piece of history. 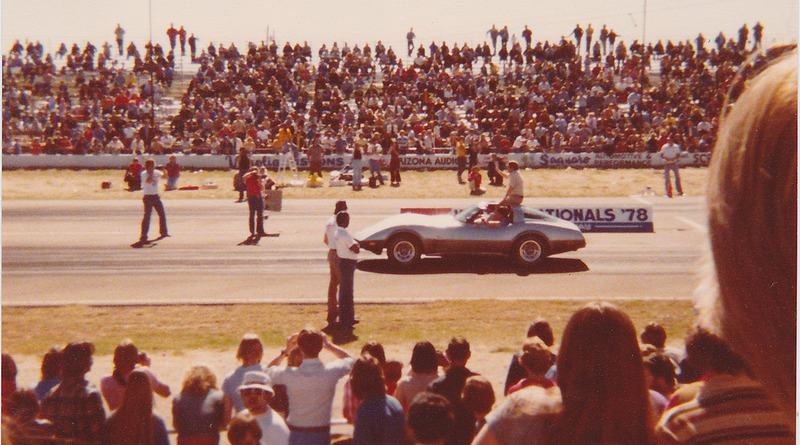 Even in all my Googling, I was able to find very few pictures from the Dragway’s days in operation. I’m amazed at how many people were out showing their support, and at how over the years since, the entire facility has gone back to desert. Now, where can I get some of that Billy Beer? Cool write up! 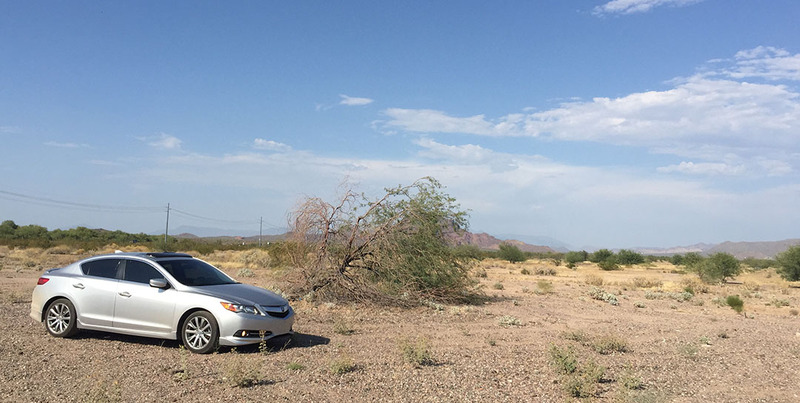 Always happy to see another high mileage Acura still going. Thanks Nate for reading! Hope you had a great holiday weekend. strange how nature takes back over, like it wasn’t even there! I know, that’s what was kind of crazy. All that infrastructure, and now just a few decades later, it’s like it never existed! I used to go to Beeline in the early -mid 70’s. Wish I could find pics of a Corvair called “Nadar’s Nightmare”. For a Corvair, it was pretty fast and fun to watch. Makes me sad to see it gone. Thanks for commenting, Will. If you end up finding pics of that Corvair, or the Dragway itself, let me know! Would love to update this post with some of the facility’s history from someone who actually visited it when in operation.